The many wonders of Turkey, as laid down by UNESCO. When you think of holidays in Turkey then it’s more than likely you’ll be thinking of a beach holiday. That’s a shame because there is so much more to see in this amazing country, not that the beaches aren’t wonderful either. To be honest, to explore it properly you might want to consider hiring one of the many Luxury Villas in Turkey they have to offer. Check them out at http://kas4villarentals.com/ their selection is vast. To give you an example of what’s out there here is just a little taster. All of these sites have been sanctioned as having major world importance by UNESCO so they come with a very high seal of approval. Hierapolis-Pamukkale. This geological oddity in the south west really needs to be seen to be believed. 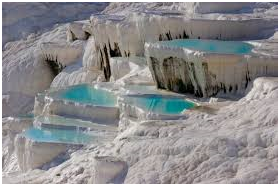 Hot springs beneath the surface have created a “white castle”, as it is called, of terraced pools. This beautifully clear blue water pools sit in bowls, trapped in pure white crystal. It’s like and alien landscape and has been used in films many times. The rock site of Cappadocia plus the National Park at Göreme. Centered in the middle of Turkey; again the strange geological make-up of the country give us the wonderful rock columns known as “fairy chimneys” in Cappadocia. These naturally made pyramid shapes are the product of eons of erosion and weathering that have given the locals a multitude of uses from the home of hermits, places to store food or bolt holes for bandits and outlaws. For those who prefer to see some built heritage there is the Safranbolu. It was on the great trade route of the Ottoman empire that stretched up to Hungary and Austria and brought in the wealth of the East given Turkeys perfect location bridging East and West. It takes its name from the saffron that grows in abundance around it. It contains many features of Turkeys architectural history. It’s got great shopping too. 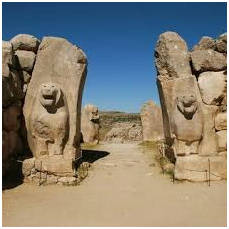 The ancient capital of the Hittites Hattusha. Built high in the Mountains near the Black sea, this ancient city, a symbol of the power wealth of the Hittite empire, remains incredibly well preserved. Walking through the Lion gate is an incredible experience. One can almost feel as if you’ve been transported back to 1200 BC when the Hittites were at the height of their powers. Mentioned the names of Helen, Paris, Agamemnon and Odysseus and you probably get an image of siege and great battles. The site of Troy is believed to be on the coast of the Aegean Sea in Southwest Turkey and some evidence of its walls have been found and a visitor centre built to show the finds from the site. There are also a few representations of the famous wooden horse plus the one used in the 2004 movie Troy. That’s 5 down, only another 11 to go to complete the UNSECO set for Turkey.